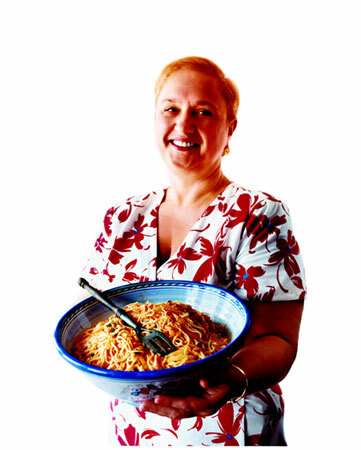 On a Friday early in February of 2001, my boss, Judith Jones, and I drove out to Lidia Bastianich's house on Long Island to shoot photographs for her new book, Lidia's Italian-American Kitchen. We arrived early in the morning at Lidia's house and were warmly greeted with coffee and (of all things) bagels. There's something friendly and reassuringly homey (literally) about the fact that Lidia shoots her TV series in her own kitchen; what you see on the screen is Lidia's own stove that she uses every day, her own pots and pans and utensils. So Judith, Lidia's editor, wanted to take the still photographs for the book there as well--it would be easier for Lidia, logistically speaking, and true to her style of working. 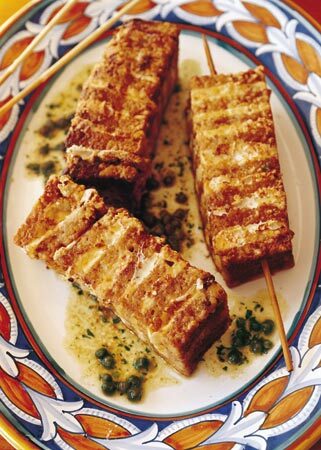 The photographer for the book, Christopher Hirsheimer, is much in demand for her food photography. She was an executive editor at Saveur and has taken the pictures for many magazine stories and cookbooks, including Knopf's own Julia and Jacques Cooking at Home and Learning to Cook with Marion Cunningham. We were lucky to have her. Christopher was also perfectly suited to shooting in Lidia's home because she uses only natural light when shooting her photographs. (That's also part of the reason we got out to Long Island so early that Friday: Days are short and often overcast in February, and we wanted as much working time as possible.) We were happy to find that a wall of windows lined one side of Lidia's kitchen, and Christopher set up her camera there to take advantage of the light streaming in. The first photo she took, the jacket image (1), was taken right next to the windows, as you can see from the illumination streaming in from Lidia's right. Lidia and her assistant Chris Styler whipped up some pasta, the painting on the white wall behind Lidia was taken down, the pasta was placed in one of Lidia's serving bowls and handed to her, and Christopher took the shot. Simple, quick, and effective. You can compare Christopher's original shot with the image as cropped and overlaid with text and graphics for the jacket, here. Next Christopher and Lidia turned to technique shots, the step-by-step photos that illustrate a recipe. In this photo (2), you can clearly see the wall of windows that provided the light for the day's shoot. Lidia is preparing the dough for Potato Gnocchi. 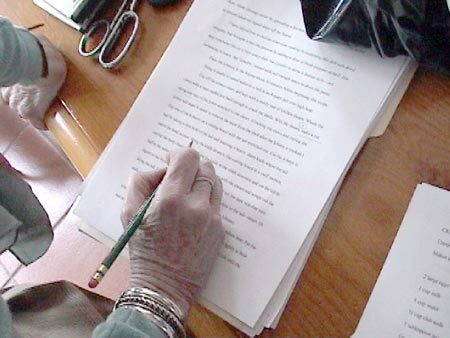 Christopher watches through her viewfinder and snaps the pic, which became photo number 1 (3) on page 172 of the finished book. Judith Jones looks on. 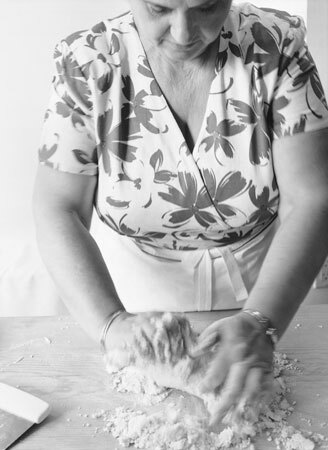 Occasionally, Christopher would take a photo while Lidia's hands were actively at work--as she worked the dough of the gnocchi (3), for example--which gives the photo a sense of motion and the home cook a sense of the activity described. More often than not, however, Christopher would have Lidia pause as she was working so that the photo taken shows an exact moment of a given technique. For instance, in Lidia making ravioli (7). 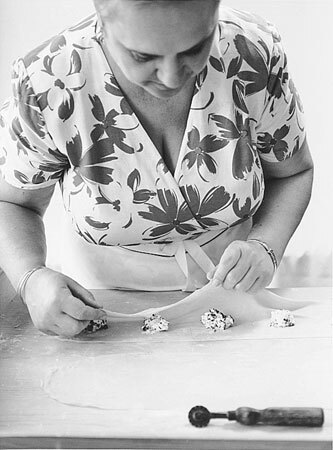 Lidia and Judith wanted to show how to fold dough over the filling, so Lidia pauses as she's doing so, providing a crisp image without motion. Later, we moved from Lidia's kitchen table to her stove. 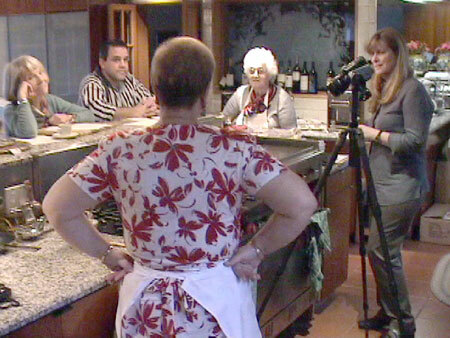 Here (9), she discusses a shot with (left to right) Judith, her assistant Chris Styler, her mother Erminia, and Christopher Hirsheimer. 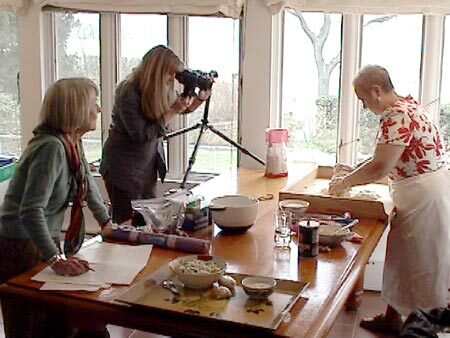 All were involved with the shoot, Judith as described above, Chris with preparing ingredients that were to be photographed next, and Lidia's mother with general help (and she made us each a mean espresso!). When all was ready, Lidia stepped up to the plate for a quick crepe. This particular pic (10) you'll only find here on our web site--a crepe photo never made it into the finished book. 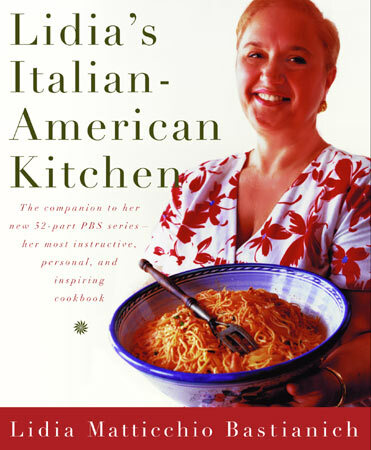 All the technique photos in Lidia's Italian-American Kitchen are in black-and-white. That was a conscious decision; the photos were meant to show precisely how to cook a certain recipe but also to have a certain stylized beauty. We think Christopher's photographic technique, highlighted by book designer Ralph Fowler's interior design, succeeds very well at both. Christopher Hirsheimer also took color photographs of finished dishes, but much to my chagrin I wasn't present on the days those pictures were taken. One of the great virtues of Christopher's photos is that they show real food, food that isn't over-stylized or falsely manipulated to "look good." 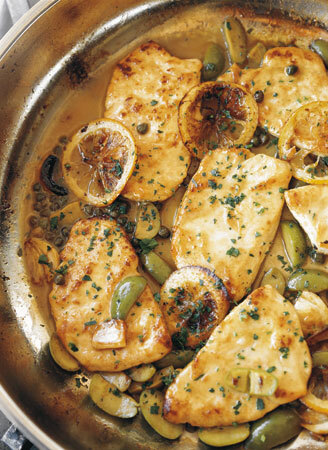 They look good--indeed, delicious--all on their own. One of my favorite color shots is the photo of Spare Ribs Roasted with Vinegar and Red Pepper (11). 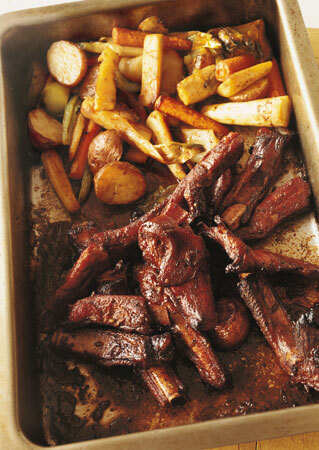 There are no pretensions here--the food isn't even on plates--it's just a photo taken right after the roasting pan was taken out of the oven, with spare ribs looking like they're still sizzling from the heat of the oven and potatoes and carrots and other root vegetables roasted in the pan along with the ribs. 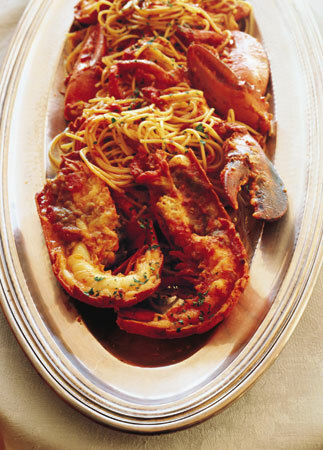 This is real food, cooked the way people actually cook at home. You may wonder if I got to sample the wares. (Or you may not.) I'm sad to say I didn't. Everyone dined magnificently, I'm sure, the two days they shot the finished food pictures. On those days, the food would come out of the oven or off the stove, Christopher would take a picture of it, and then everyone present got to sample it. All that glorious food--Spare Ribs (11) and Scallopine in Lemon-Caper Sauce (12), Lobster fra Diavolo (13) and Fried Mozzarella Sandwich Skewers (14), and on and on--I was immensely jealous. On the day I was there, time was of the essence, and we hurried to catch as much sunlight as possible. When one technique shot or series of shots was finished, those ingredients were set aside and the next brought out for shooting, so nothing actually went into the oven. When we took a break for lunch, we had to do so quickly--we ordered take-out pizza.